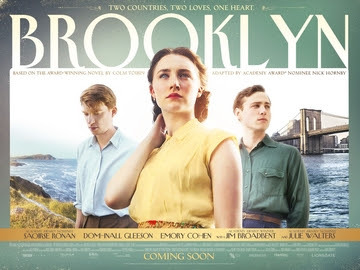 I saw a relatively new movie called Brooklyn so here's my review. As usual, first comes the plot with spoilers (duh!) and then my impressions without spoilers. That part should tell you whether you'd like to watch it or not. Plot: The movie starts with Eilis, young woman who works for rude Ms Kelly in her store. Eilis lives with her mother and sister Rose in southeast Ireland. Her sister thought that Eilis should have a better future, so she arranged her to go to the US to work and live there. On the ship to the US, she met a woman who helped her with her sick stomach, gave her some advice on sharing bathrooms and how to act when she gets in the US. Also, she directed her to Brooklyn as it is a home to many Irish people. She finds accommodation at an Irish boarding house where she dines with landlady and four other young ladies. She often exchanges letters with her sister which makes her extremely homesick. One night she decides to go out on a dance where she meets Tony, Italian guy who soon becomes her boyfriend. This development makes Eilis more comfortable in the US and she thinks she could live a happy life there. After some time, Eilis gets visited by Father Flood who tells her Rose died. Eilis decided to go back home, but as Tony is afraid she wouldn't come back, he persuades her into marring him. At home, Eilis keeps her marriage a secret. Because nobody knew this, her best friend introduced her to an eligible bachelor Jim and they start to spend more time together. You can see they start to like each other but nothing happens. Finally, Eilis is confronted by Ms Kelly who knows she is married. Eilis then realizes what kind of people are in her town and decides to tell the truth to her mother and goes back to Tony in Brooklyn.